Make a great addition to your next coffee break. Made with rolled oats, coconut and golden syrup also contain no artificial colours, flavours or preservatives these tasty cookies can be enjoyed by the whole family. 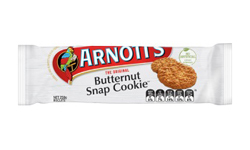 Each packet contains approximately 21 cookies and has a recipe for an interesting way to use Butter Snap Cookies whilst baking. Sugar, Wheat Flour, Oats, Coconut, Butter (Cream (from Milk), Salt), Palm Oil, Golden Syrup, Baking Powder, Salt, Emulsifier (Soy Lecithin), Antioxidant (E307B from Soy). Omg these are my favourite ever! So creamy yet crunchy.